You may have to pay payroll tax on payments to contractors engaged in relevant contracts. as other goods that incorporate them. Relevant contracts are taxable unless an exemption applies. If the contractor payments are taxable, you may claim an approved deduction from your taxable wages if the contractor provided materials and equipment. person's services are provided to you by an employment agent. If you are satisfied that neither of these apply, you can then look at whether a relevant contract exists. 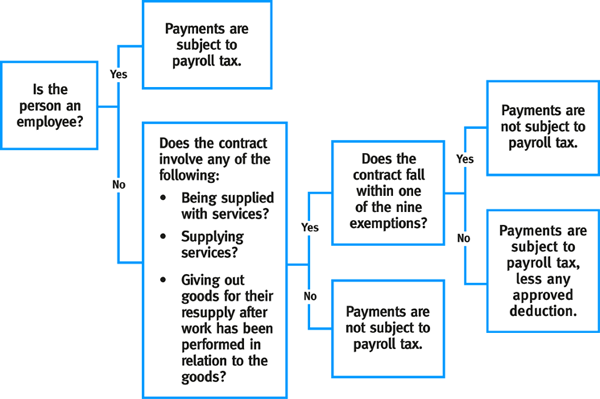 Use this flowchart to help you decide how much of your payments, if any, are subject to payroll tax.